Congratulations! You just stumbled upon a surprise post. The best part about this post is that it prepares you for tomorrows post. 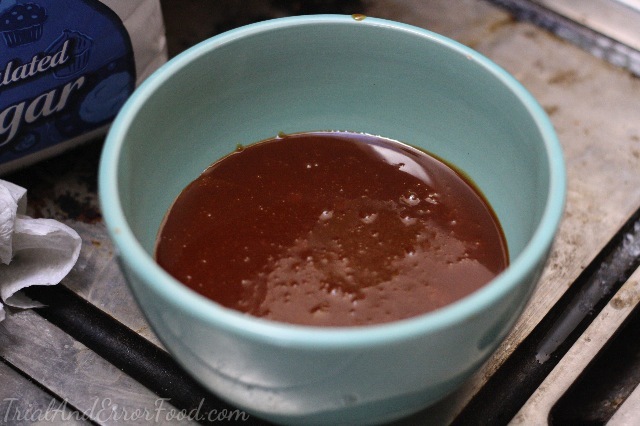 Also the other best part of this post is that there’s a recipe for delicious salted caramel sauce at the end of all those pretty pictures and awkward ramblings. 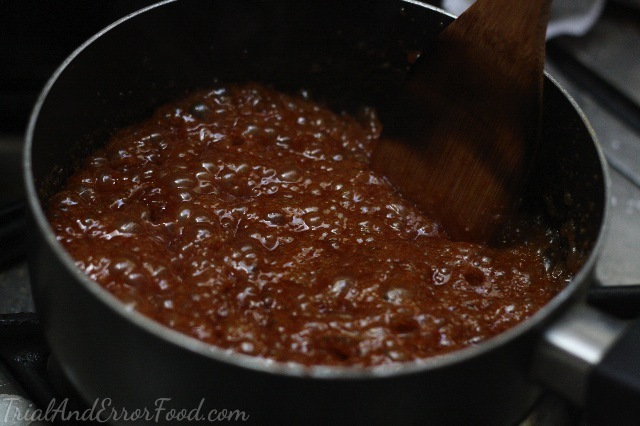 I’ll confess I cheated a little when making this sauce. I saw recipes that called for unsalted butter and then adding salt later and I thought to myself “well that’s kind of dumb, why not just use salted butter and be done with it?” so that’s what I did. It takes a little patience and thorough prep-work but once it gets going it’s a super quick process which yields incredible results. Plus it’s waaaay cheaper than buying caramel with an unreadable ingredients list at the store. It’s perfect for drizzling on ice cream, adding a spoonful to your coffee, or dunking apples, but my personal favorite way to enjoy is coming up in tomorrow’s post, so stay tuned!! Let’s get started, shall we? You’ll just need sugar, salted butter and heavy whipping cream. And we’re off! 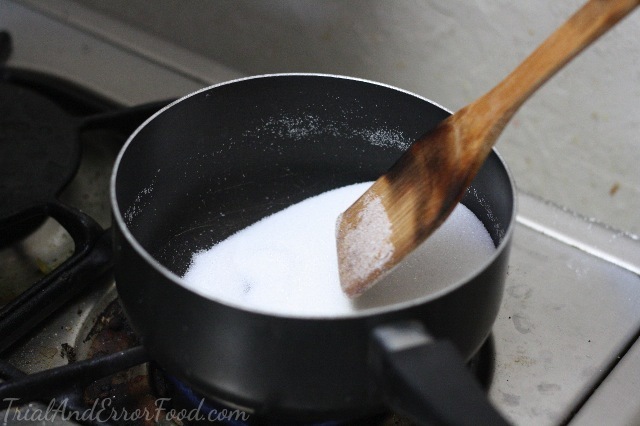 Begin by melting the sugar in a medium pot on medium-high. 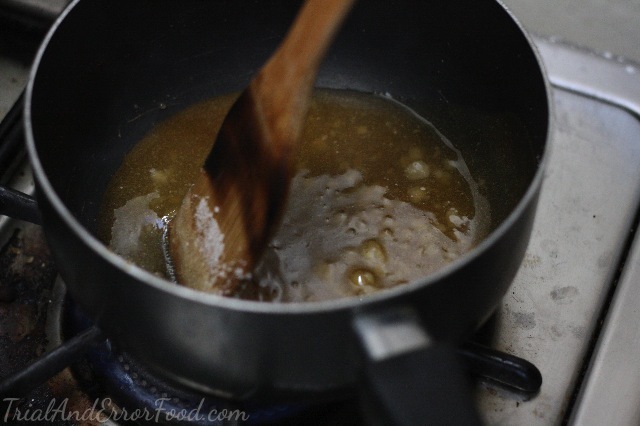 Rumor has it there are two ways to do a caramel sauce- wet and dry. 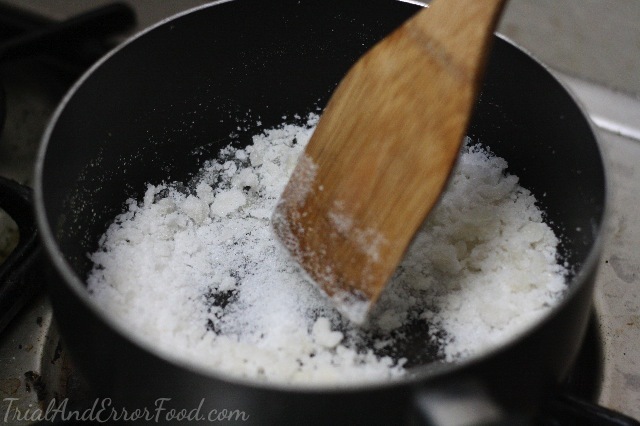 Wet requires melting the sugar in water and sometimes corn syrup and dry requires melting the sugar on its own. I obviously prefer the dry method- the caramel has a richer color and taste AND it’s thicker. It’s a no-brainer in my mind. For a while you’re going to be standing in front of the stove, impatiently stirring sugar in a pot wondering what you’re doing with your life and how on earth this is going to work and then the sugar begins to do this, and all is well in the world again. Keep going, the sugar goes through a few stages before it completely melts. You’re on the right path. Finally. I mean hooray we did it! Once it’s all melted it should look something like this. Add in butter. I unceremoniously dropped in the whole log’o'butter Paula Deen style. 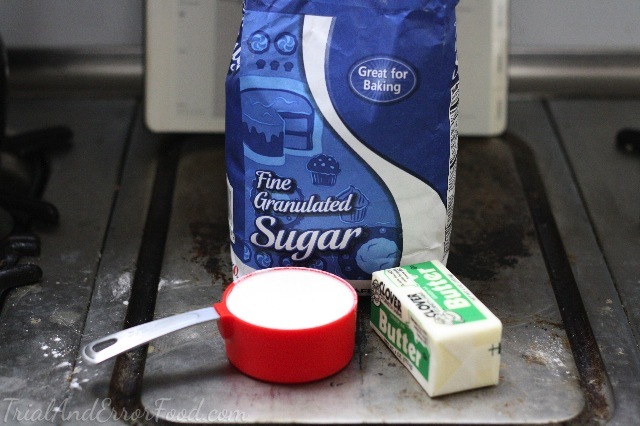 The melted sugar will bubble up- make sure your pot is large enough so you don’t take a bath in boiling hot sugar. Burn wounds are burn wounds people, even if you got them in a delicious way. And if you don’t care for the salted caramel taste, just make sure you use unsalted butter. Mmmm, melted sugar and butter. Yes and please. 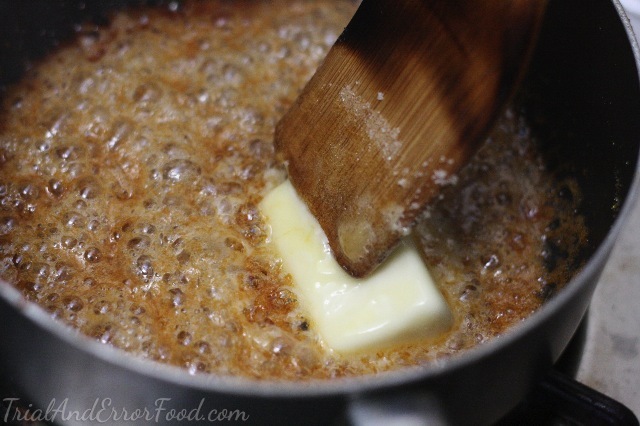 Once the butter is fully melted and incorporated in the melted sugar, remove from heat. Listen people, I realize there’s some sort of professional technique to this and you’re supposed to slowly add in the cream and mix until it’s incorporated and then add a little more and so on and so forth. Not what I did. I think that’s just a safety precaution, and to avoid a lawsuit I’m going to go ahead and say- slowly add in your cream little by little. I just dumped the whole thing in and stirred quickly. Worked just fine. There it goes all bubbly! 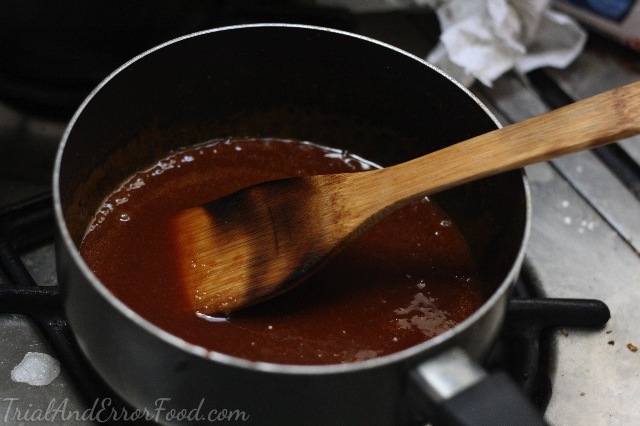 And once the caramel-y storm calms itself you are left with delicious, thick homemade caramel sauce! Super simple, right? 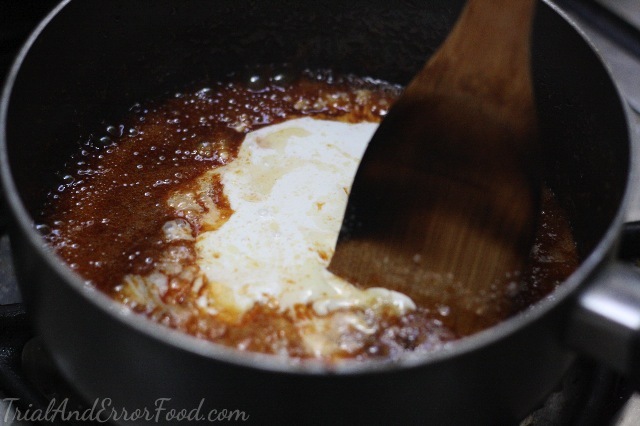 Make sure to check out tomorrow’s post to see my favorite way to enjoy this salted caramel sauce!! 1. In a medium sized pot heat the sugar, continuously stirring until it melts. It takes a while, and it goes through a few stages before it completely melts. 2. 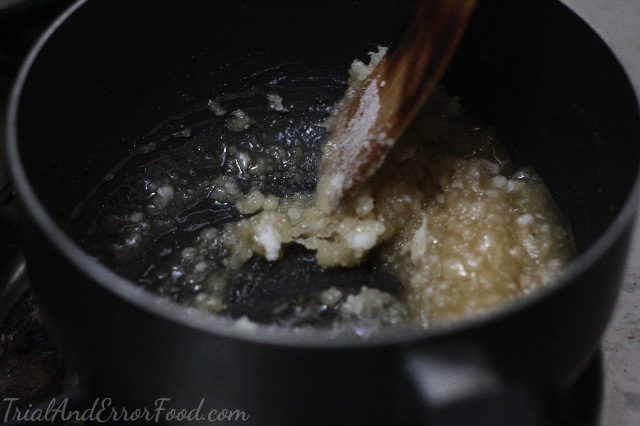 Once completely melted, add in butter and stir until the butter is melted and fully incorporated. Remove from heat. 3. Slowly add in cream, whisking as you go along to fully incorporate. The sugar/butter will bubble and rise along the side. 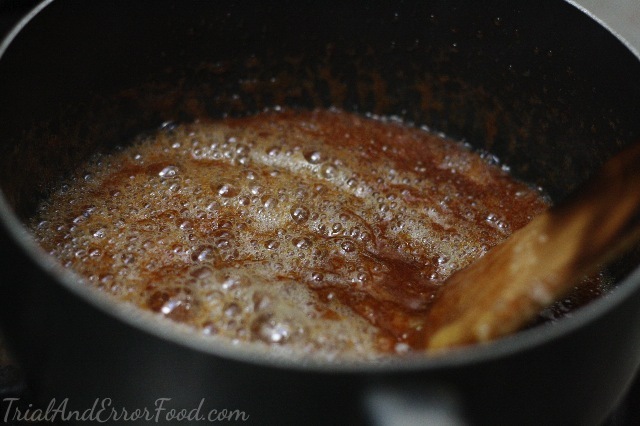 Be sure your pot is large enough so the caramel doesn’t boil over. 4. Allow to cool and enjoy!